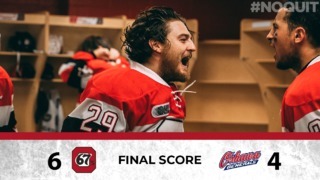 OTTAWA – Coming into Peterborough on an eight-game winning streak on Thursday night, the Ottawa 67’s opened their three-in-three stretch with two points, extending that win streak to nine games with a 4-3 shootout win against the Petes. 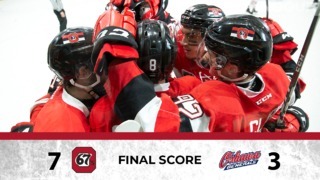 Not only was the streak extended, the win also makes the 67’s the first team in the league to clinch a playoff spot. Kyle Maksimovich scored twice, on top of picking up the game winner in the shootout, while Lucas Chiodo added the Barber Poles’ other goal. Ottawa came out strong in the first period, as the visitors led 2-0 at one point in the period thanks to goals from Maksimovich and Chiodo, before Erik Cernak cut the 67’s lead in half before the first intermission. Maksimovich added his second of the game in the dying seconds of the second period, giving his team a two goal edge after 40 minutes. The Petes clawed their way back in the third period, tying things up with two goals coming from Adam Timleck and Ryan Merkley. 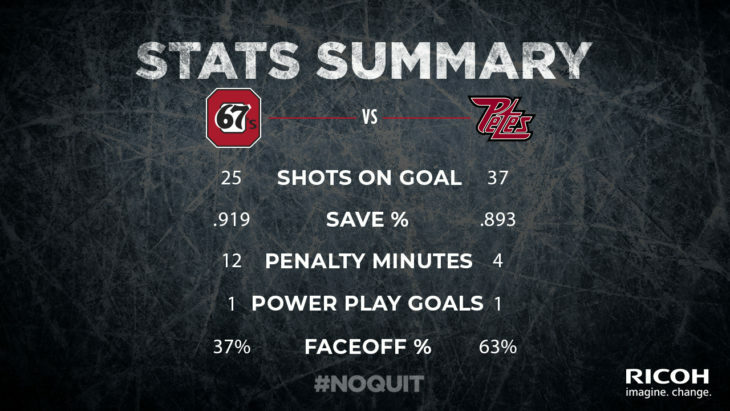 Five minutes of three-on-three overtime was not enough to determine a winner and off they went to the shootout, where 67’s shooters Marco Rossi, Tye Felhaber and Kyle Maksimovich all beat Petes goaltender Hunter Jones to give the Barber Poles their 38th win of the year and their ninth in a row. 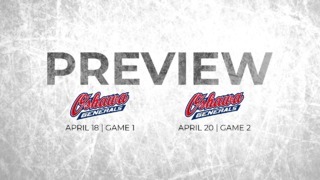 Ottawa will be back on the ice tomorrow night for their second game of a three in three, as the team will face off against the Mississauga Steelheads at 7:00 PM. With two goals and an assist on Chiodo’s goal, Kyle Maksimovich finished the night with three points and the shootout winner, earning him the game’s first star honors. Cedrick Andree was rock solid in his league-leading 29th win of the season, in which the Orleans native stopped 34 pucks. Lucas Chiodo also finished the night with three points (one goal, two assists).